Too many of you are so engrossed in your busy life and you pay little or no attention to your health. The quest for wealth is of paramount importance, you get yourself choked up with schedules, but yet you still have no time to pay attention to your health. I understand your plight, we have all been there before. Since "health is wealth", then i think it should be deserving our attention too, because without it we definitely can't go on. Even with a busy life and schedules, there are still tips to help you stay healthy. Demanding work schedules and competitive environments tend to push us to the extreme, wherein we aggressively push ourselves even further to achieve our goals. Who can blame you? It's just the way the world is. Going to the gym in this situation is out of question, because you need the energy for work, meeting your deadlines and you are too tired and drained in the evenings after work to workout. At the end of the day, we end up becoming lazy, sluggish, fatigued and the worst part comes when we begin to gain weight, which keeps increasing and we don't do anything about it until it is too late because 'we're busy', right? There is no need to worry, though. Because there are a few super simple ways to watch your health and your weight, so that your wellbeing is not compromised Simply incorporate these into your lifestyle and you're sorted. Check out 12 ways you can still maintain a busy life and at the same time, keeping your health in check. In the midst of much stress and pressure, a few moments of peace and quiet will only do you good. Stretch your body well, sit up and just inhale and exhale deeply and slowly in the morning and every time you feel stress building up. This is a meditation of sorts that will certainly help calm you down. Stress can often interfere with your sleep cycle, but where health is concerned, getting a good amount of sleep is extremely important. Apart from that, a proper sleep cycle and schedule is essential. Following the 'early to bed, early to rise' mantra will work wonders for you! Olive oil is definitely a healthier option when it comes to eating healthy. Also, olive oil is healthier than sunflower or groundnut oil. Change your fuel for a healthier you! Yes, you heard that right? Finishing your dinner before 6:00 pm has many health benefits in store for you. Weight loss is one of them. Eating dinner right before going to bed contributes to a growing tummy. Yes, you can go ahead and celebrate for this. Dark chocolate contains zinc, which in turn is used to produce Leptin, that regulates fat storage. But, in moderation. One cube (not the entire block) per day is enough to keep your choco cravings in line. Exercise is important, but you can go for one that you like, because if you exercise just for the sake of it, it can become monotonous and it will. You can go for cycling, swimming, jogging, yoga, dancing, zumba or whatever else you like. But, stick to it once you start. It will help you feel fresh and energised. Home-cooked meals are the best if you're watching your health. Avoid eating out at all costs. Take home-cooked meals to the office, because it is healthier and will also help you in keeping control of what you eat. Do it even if you hate it. Milk contains calcium – a sure-shot fat buster. More calcium even prevents fats from forming. Down that glass of goodness! Incorporate more of proteins and fibre into your diet and reduce your carbohydrate intake. This will make all the difference. Proteins are good for building muscles, which are the single most efficient reason behind burning your fat. If you have a desk job, you definitely need to cut down on your carbs. Carry dry fruits to the office as a substitute for fatty snacks and nibble away whenever you feel munchy. They are healthy, nutritious and very filling too. Although, make sure you don't eat the salted ones, but plain ones. Avoid junk food at all costs. We are sure it is not going to come as news for you that alcohol is damaging for the body as well as for overall health. We also agree that partying and letting your hair down once in a while is essential, but that does not mean that you need to get sloshed. More alcohol means higher blood sugar levels, which means more stress on your liver. Chill out, but drink within your limits and you'll be fine. This is especially for those people who have desk jobs. It is extremely important to have some physical activity. 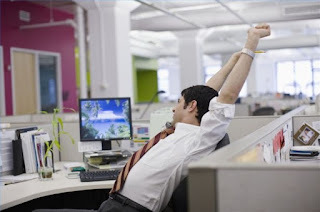 Jobs in which you have to sit the entire time is not good for health as it causes posture issues and shuts down the production of enzymes that break down fat. Stand, move around, get your limbs in action from time to time to increase blood circulation and metabolism. Take a walking break or simply stand up after every one hour, for a while.